“Jurgen Van den Broeck is the absolute leader for the GC. We aim for a top ten place with him. He’s in the right headspace and is really motivated." Eleven days before the start of the 98th Giro d’Italia Lotto Soudal announces its selection. Sander Armée, Lars Bak, Stig Broeckx, André Greipel, Adam Hansen, Greg Henderson, Maxime Monfort, Jurgen Van den Broeck and Louis Vervaeke will represent the team. Sports director Bart Leysen gives more information about the selection. “Jurgen Van den Broeck is the absolute leader for the GC. We aim for a top ten place with him. He’s in the right headspace and is really motivated," he said. "Jurgen went to Tenerife for a training camp. This week he takes part in the Tour de Romandie. Considering he has just come back from an altitude training camp he has to get some competition rhythm now. You can’t immediately benefit from an altitude training camp in a first race, that’s why it’s important to finish a race before the Giro. “Maxime Monfort will be supporting Jurgen Van den Broeck. Uphill he has to stay with Jurgen as long as possible. It might be that Maxime gets a good position in GC as well by the end of the Giro. It can be good that the pressure doesn’t rest on his shoulders alone. Sander Armée proved in the previous Giro that he can follow a long way uphill, we take him to Italy to assist Jurgen van den Broeck in the mountains. “Obviously André Greipel is our sprinter, we want to win a stage with him as soon as possible. I expect at least seven chances to sprint. Then there are stages in which a reduced peloton – let’s say about half of the peloton – will sprint for the victory and André Greipel can be part of that group. Greg Henderson will be the lead-out man for André in the sprints. “Adam Hansen will ride his eleventh Grand Tour in a row. He can definitely have a go of his own on some days. In the sprint he’ll have to work for André Greipel. In tougher stages it’s a priority to help out Jurgen Van den Broeck. Lars Bak is an experienced rider as well, whom we want to let play a role in flat stages where André is our man for the sprint. If necessary Lars can also help the leaders when there is a dangerous situation. “Both for Stig Broeckx and Louis Vervaeke this will be the first Grand Tour of their career. It’s important for them to get the experience and set a next step in their evolution. 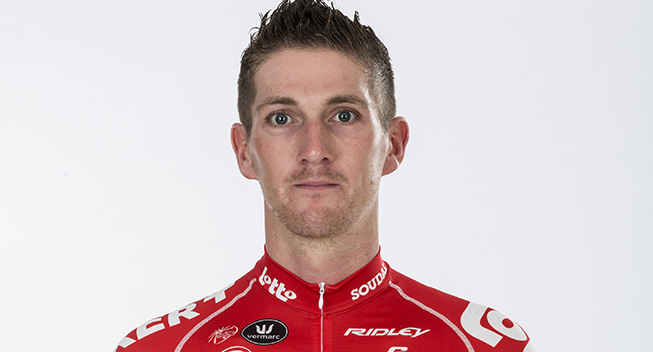 Stig Broeckx is the same type of rider as Lars Bak, not a climber. Stig can join a breakaway, but he’ll mainly have to work; at first instance for André and other times for the GC riders.